The lilacs of Descanso Gardens are arriving, and The Huntington's wisteria vines are making a lovely showing, too. Lilacs at Descanso Gardens and wisteria at The Huntington are looking so purple and pretty as March 2019 winds down. Nope, flower blooms don't roll out according to the color wheel. As amazing as that would be, neither the bursting wildflowers, nor the more cultivated buds found around our town's more manicured beds, ever show up in spreads of just red, then only orange, then yellow, and so forth. Well, very rarely, at least. But are there moments when certain hues take centerstage, at least for a few fabulous weeks? Around Southern California, that seems to be so. And while we're still savoring the oranges and yellows of poppies and desert marigolds, we can turn our gaze to our local gardens, where purple is about to pop. 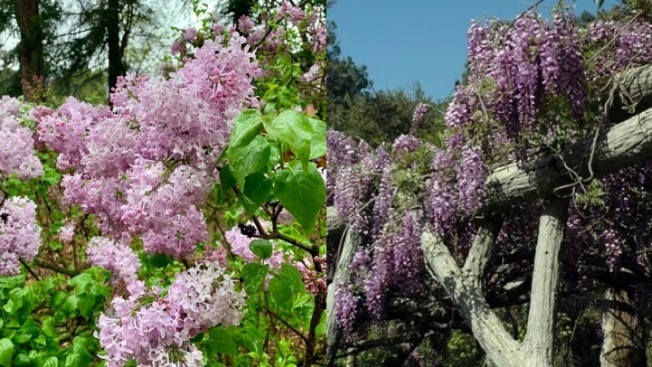 Specifically, the lilacs are starting to show, and get wonderfully sniffy, at Descanso Gardens in La Cañada Flintridge, while the draping wisteria found in Japanese Garden at The Huntington Library, Art Collections, and Botanical Gardens is beginning to do its purple-tastic thing. And by "beginning to do" we mean the vines are budding, with a bloom still to come. But in The Huntington's Chinese Garden, visitors can find the wisteria further along in its bloom cycle. 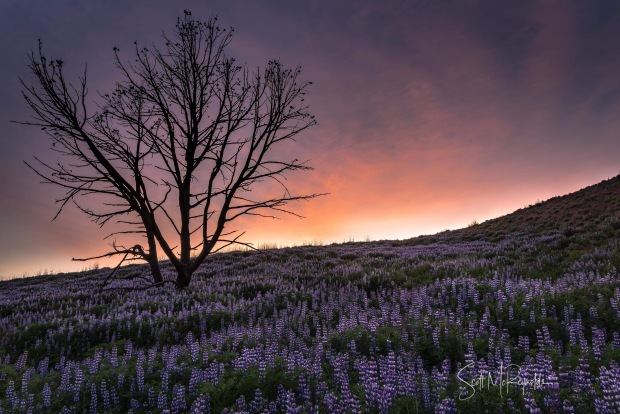 For sure, you'll need to pay admission to both gardens to see both examples of nature's epic purple-a-tude. And, yes, there are so many other spectacular springtime sights, at both spots, including the peaking tulips of Descanso Gardens and all of those flowering fruit trees at The Huntington. The purple vibe can also be found in an iconic wildflower, the magenta ice plant, if you can road trip to Pacific Grove from early April to late May. This is the famous "Magic Carpet" that shows up, right next to the ocean on the Monterey Peninsula, and seems to be far more purple than any other purple thing on the planet. Lavender lovers, alas: You still have a couple of months to go before your favorite herb puts on its purple show. June is a primo purple time for this fragrant wonder, up around Ojai, over at Highland Springs, and other not-so-far locations.